You can’t beat a dark roasted coffee for having a full bodied flavor, but an underlying bitterness and noticeable acidity often turn coffee drinkers towards lighter roasts after they’re left with a bad taste in their mouths. Enter “low acid coffee.” It is known for being less bitter than many regular coffees and easier on the stomachs of those who are sensitive to the acidity of coffee. 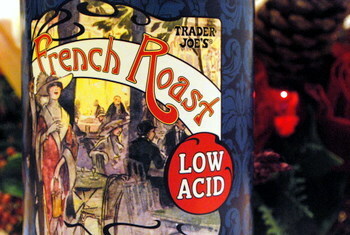 Trader Joe’s recently introduced a Low Acid French Roast, a variation on their regular french roast. The coffee is full bodied and very smooth and fruity for such a dark roast. The deep caramel/burnt notes that are sometimes obvious in dark roasts are subtle, and leave plenty of room for the natural sweetness of this coffee to come to the forefront. Unless you’re looking for a sharp finish, this is a great, highly drinkable option with a lot of flavor that should be popular with fans of regular dark roasts and those who might normally opt for something milder.